If you’re looking for a one-stop shop where you can eat great food, experience local charm and buy authentic maple syrup to take home, Sugar and Spice is a must-do on your Killington list. This family-run restaurant has brought several Vermont traditions together under one roof for everyone to enjoy. Serving old-fashioned comfort food for breakfast and lunch, Sugar and Spice gets pretty packed during peak months. Lucky for you, there’s lots to look at and purchase while you wait for your food in the extensive and eclectic gift shop. A true Vermont sugar house, Sugar and Spice makes its own maple syrup and has a hearty breakfast menu – the best in town. 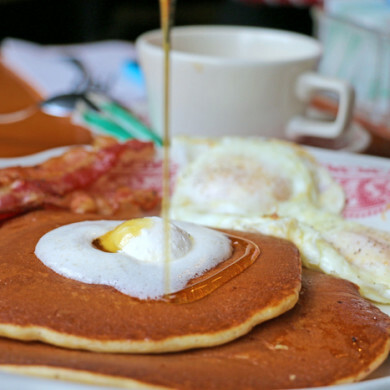 Order the Sugar House Sampler – a large plate of two eggs, two pancakes (we recommend the sugar & spice and maple walnut flavors), two sausages and two strips of bacon. Top it off with an embarrassing amount of coffee, and you’re good to go. You may notice the buckets on the outside of the trees as you go in. They serve a purpose, collecting sap that is expertly boiled in spring to create maple syrup at the on-site working sugar house. At the heart of the restaurant and store is a two-story open gallery, where you can watch the magic happen right from your table. Vermonters refer to the syrup as ‘liquid gold,’ believed to have been discovered by the Native Americans. Since its discovery, it is interesting to note, little has actually changed about the production of maple syrup. Syrup is so important to these folks that all breakfast items are served with the real deal. In fact, if you ask for the fake stuff, you’ll be charged extra! A true “lumberjack breakfast” is the perfect fuel for a day of activity and adventure. Insider tip: use maple syrup instead of sugar in your coffee for a little taste of Vermont heaven. All-in-all, a visit here equals great food, friendly service and something to take home to the family. Oh, and don’t leave without snapping your picture with the iconic stuffed moose seated at the picnic table outside. Sugar and Spice is located along Route 4 in Mendon, VT. Call (802) 773-7832 or visit the Sugar and Spice website to learn more.